the Google Nexus 7 and Amazon Kindle Fire HD. “The displays on existing mini Tablets from Amazon and Google outperform the iPad mini in most of our lab tests. Pixel resolution: iPad Mini has a 1,024×768 resolution with a pixel density of 163 pixels per inch (ppi). “That’s now considered to be rather on the low side.” The Nexus 7 and Kindle Fire HD are both rated at 216 ppi. 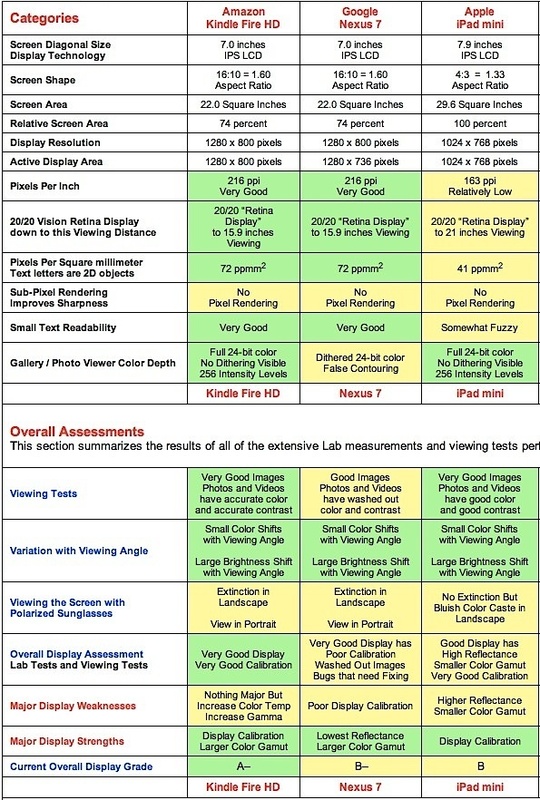 Color gamut: The iPad Mini has an “antiquated” small 62 percent Color Gamut. The Kindle Fire HD and Google Nexus 7 both deliver a much larger 86 percent color gamut. And the iPad Mini compares even more unfavorably with iPad 3 and iPhone 5, which have full 100 percent standard Color gamuts. Essentially a reiteration of DisplayMate’s previous criticism of the Nexus 7’s display, which got a “current overall display grade” of “B-”, versus “A-” for the Kindle Fire HD, and “B” for the iPad Mini.